Patriotic Soldier Collaboration Poster. Do a project that your kids won't soon forget. This activity is so much fun because, in the end, you will have a very large (approx. 28” x 35”) poster to display in your classroom to honor our soldiers on Memorial Day or Veterans Day. Also, along the way, students will work together as a group to create a beautiful tribute. Size of the poster varies based on printer settings. There are 20 pieces to this poster. 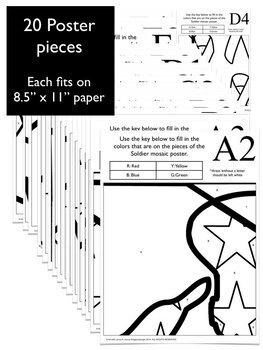 Each piece fits on a regular sheet of copy paper. 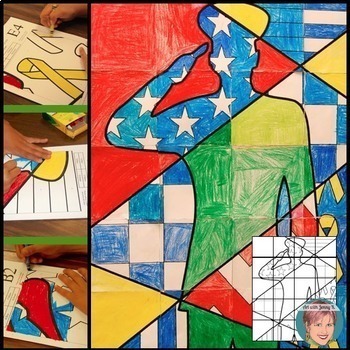 (If you have more than 20 kids in your class you could combine my soldier poster with my FREE “Thank You” collaborative poster or have two kids work on one sheet. Teachers always find creative ways to use my resources and I’m always amazed!). I have (in very small font) written a letter to correspond to each matching color directly on the art. My suggestion is that you give students crayons or markers to color this poster. Encourage students to color dark with their crayons so that in the end the poster will be bright and colorful. I have included a finished example if you'd like to show your students what they will be making. However, many teachers like to keep it a surprise until it's all put together! There are 4 different colors used on the poster, so you’ll have to supply them (probably in multiples) to the students.They are pretty standard colors; red, blue, yellow and green. Areas left blank need to be left white. If each student doesn’t have the exact same shade of the colors, it is alright, it just adds “character” to the final product! 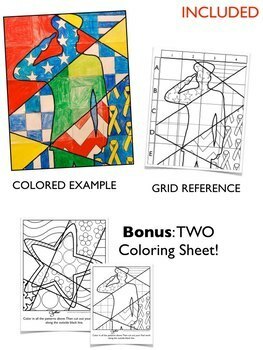 After each square is colored by your students have them cut out the squares and write the corresponding letter and number on the back of the large square that they just colored. I have provided directions for all steps of this poster, including how to put it together. When it is all put together and colored you could run it through your school laminator. 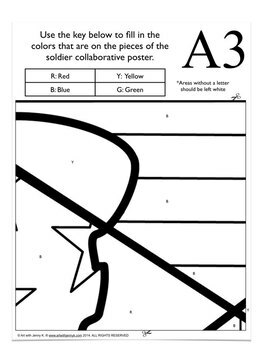 I have included bonus coloring sheets at the end so student can have a small copy for themselves since they will not be able to keep the large poster. They can color the individual coloring sheet however they want! I’ve had teachers tell me that they had the group make the big poster and then displayed both the group poster and individual coloring sheets for a beautiful bulletin board!